Noel Jetson. 16 February 1933 - 10 March 2016. It is with great sadness, combined with sincere affection and pride that we honour the recent passing of Noel Jetson. Noel was the founding member of the Trout Guides and Lodges Tasmania Inc association back in 1979 (then known as the Tasmanian Professional Trout Fishing Guides), whose dedication to service and safety of visiting anglers to Tasmania resulted in the formation of TGALT and formed the basis of our Code of Ethics enshrined in our constitution. He was the first guide in Tasmania and probably Australia. 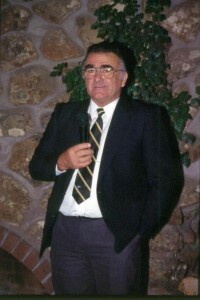 He was TGALT's first Life Member (1994). In 1980 Noel was in the USA promoting Tasmania and its world quality wild trout fishery to all he met, a theme and commitment he continued to market to all. Noel was not only a guide; he saw more in our state's trout fishery than a way of making a living. He mentored many young fly fishers, taught fly tying at the Launceston TAFE, was a dedicated club man and never backward in coming forward to advise and support local anglers. He was the first angler inducted into the Tasmanian Anglers Hall of Fame in his own life time, a thoroughly deserved recognition of his contribution across the board in trout fishing in Tasmania. Noel and his wife Lois ran a store, Jet-Fly, in Cressy for many years. It was a well-known and popular stop for many fishers as they headed to the highlands. Noel's contribution to Cressy and Tasmania's fishery is also recognised with the newest residential street in Cressy, Jetson Court, named after him. 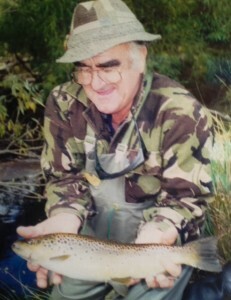 Noel's passion is woven through the fabric of our trout fishery, may his efforts and enthusiasm never be forgotten. May his spirit stroll the streams and meander the margins of our waterways for ever and if you feel a guiding hand on your cast or a helpful zephyr roll your fly over just right... it may well be NJ still giving a hand!